Onion, Poppy Seed Crackers And Crisp (Yeasted) Flatbreads - With The Daring Bakers! Its the 27th and time for another Daring Bakers' challenge! At at a time when I am desperately torn between my restricted diet and the inexplicable pull of my new oven, came these apt recipes from our hostess this month, Sarah. Sarah from All Our Fingers In The Pie was our February 2013 Daring Bakers’ host and she challenged us to use our creativity in making our own Crisp Flatbreads and Crackers! Been waiting to tell you, I got my new big oven at last! A Morphy Richards 40 liter OTG which occupies its place of pride in my dining area. Its another matter that my already crowded kitchen counter looks rather too overcrowded now as it had to accommodate my microwave and an induction stove too. Not that it really matters to me as I am so very happy to get my oven after a really long wait. Happier as it happens to be a gift from my father. Though am no stranger to an OTG, am still getting used to my new one - each one has a mind of its own as they say! Have mini bundts, Swiss Rolls, baguettes, large batches of tuiles on my mind, but am content with baking safer bakes like crackers, biscotti and granolas for the time being. Better that way as I will feel less sad burning these rather than over baking pound cakes or doughnuts. Back to the crackers, I baked these onion crackers - which we absolutely loved! Crisp onion and poppy seed flavored ones which remind you of the famous famous Maddur Vada!! I made these 3-4 times, in small batches of course. Each time, they were gone fast, some as munchies and some as an accompaniment with hot rasam and rice! Oh, they sure were yum and will be definitely made again and again, goes high on my list of keepers! 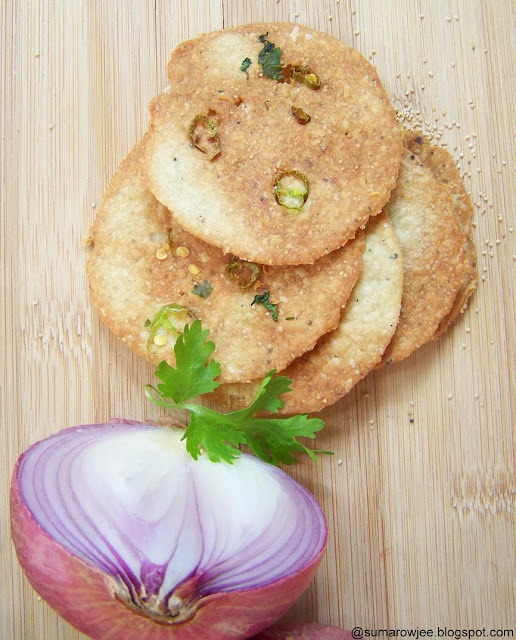 Onion and Poppy Seed Crackers : I have quartered the recipe as I am not blessed with patience and I liked them best when made with the sticky dough rolled really thin without using a whole lot of flour. You may find making these more efficient and faster if you use a silicon mat. Sift the flour, salt, sugar, pepper, baking power together twice. Stir in the poppy seeds. Keep aside. In a medium sized bowl, take the onion puree. Add the egg, oil and blend with a fork until well incorporated. Add the flour mixture. Mix well until the dough is fully combined. The dough will be very sticky, that's alright. Grease your counter. Lightly knead the dough for 2 minutes, though it will be tough to. If you have to add more flour, add very little, about a teaspoon. I preferred the ones to which I did not add additional flour while kneading. Wrap tightly in plastic wrap and rest in the refrigerator for 1 hour or more to suit your convenience. Overnight works fine too. The dough will be firmer after refrigeration. Preheat oven to moderate 180°C/350°F/gas mark 4. Line your baking sheets with parchment and grease lightly. Even after refrigeration this will be a very soft dough. If you have mixed a large portion of dough, you may want to take out only a part of it. Lightly flour your rolling pin and counter, take tiny balls of dough, roll as thinly as possible. Place them on the lined sheet. If you cant roll them as thin as you want, place them on your parchment lined baking tray and then spread them with your finger tips to make them thinner. Brush off any excess flour with a dry silicon brush. You could roll large portions of dough, cut out the crackers with a cutter . But I did not want to use too much flour or roll them thicker, so rolling them thin with tiny balls worked better for me-taste wise! Unless you roll the dough thick or use much of flour, its tough to lift the thinly rolled soft dough onto the baking sheet as they will tear. As the crackers bake pretty fast and you surely don't want them to burn while you multi-task, you may want to use multiple trays, roll 2-3 sheets of crackers at one go and then bake them in succession. Bake until almost evenly golden (mine has splotches of white, but they tend to burn if you wait for longer). The time required will depend upon the thickness but anywhere from 5 - 15 minutes. Mine took about 6-7 minutes. Watch carefully as they will bake quickly, Do not let them turn dark brown. Cool thoroughly before storing in air tight container. 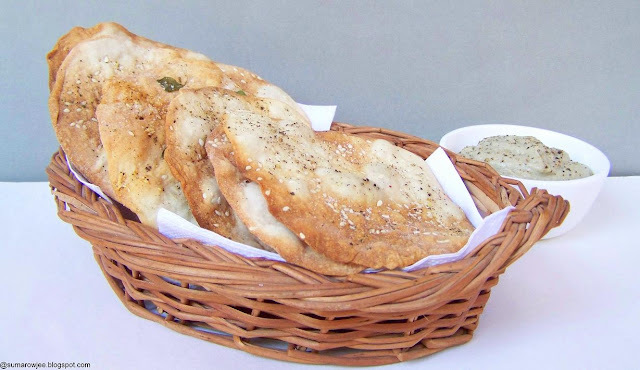 Please Note : You can add a green chilli or a pod of garlic while pureeing the onion, but do not add too many things (such as mint, coriander., garlic, more chillies) as your dough may become very sticky and tough to roll out. Or u may end up using less of onion in the puree when you measure which may not give a predominant onion flavor. If you want to roll the crackers really thin, chopped coriander or chillies in the dough will make it difficult to roll. 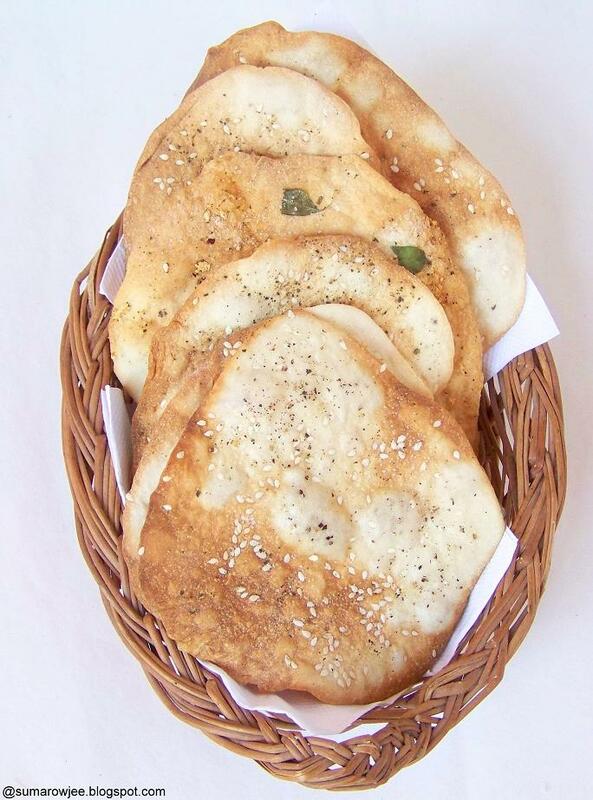 Yeasted Flatbread Crackers Another must have low fat crackers in your repertoire! Quick and easy to make as there isn't much kneading here, proof the dough and then carelessly roll the friendly dough into shapes you want, making sure you roll them uniformly thin. Top them with herbs or seeds and toppings of your choice as you roll and bake till golden and crisp. 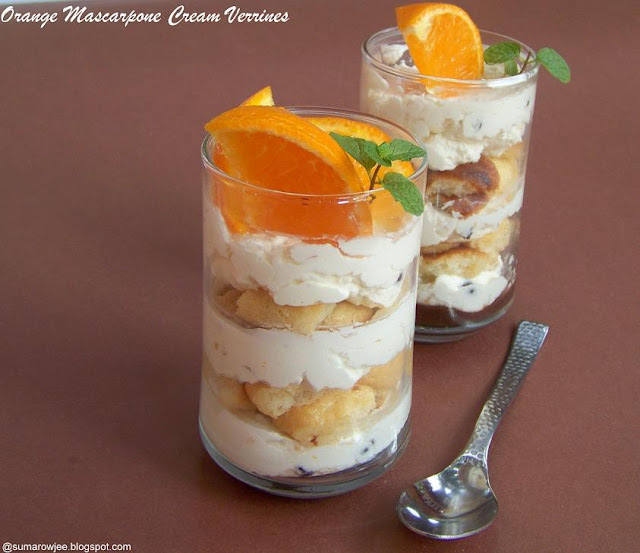 Eat with a dip of your choice or as is for in between meal hunger pangs.. In a medium sized bowl, mix the lukewarm water and milk. Add the instant yeast ( if using active dried yeast, let stand for about 5 minutes till foamy and then proceed), add the oil. Mix the flour, salt, sugar very well. Stir in flour mixture, bring it together, turn on a lightly floured surface and knead for about 3 minutes till you get a smooth dough. The dough must not be sticky or even tacky. Preheat oven to moderate 350°F/180°C/gas mark 4. Keep your toppings ready. Line your baking sheets with parchment. Divide dough into 8 or more equal portions (depending on your tray size and size of crackers you want to bake) and cover with plastic wrap. Flour your counter lightly, roll out each piece thin (mine was about 3 mm at a guess) sprinkling the sesame seeds, salt and pepper halfway through so that the seeds are rolled in. 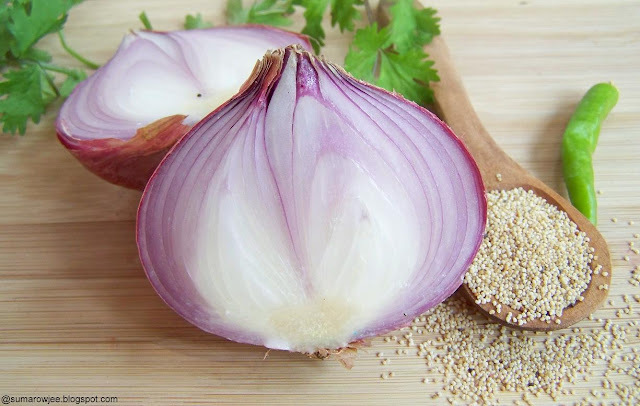 Or brush with the egg mixture (if using) and sprinkle with sea salt, sesame seeds, pepper or herbs. Transfer to the parchment lined baking sheet. Bake, rotating sheet halfway through baking, until crisp and golden, for about 12-14 minutes ( or more depending on the thickness). Watch carefully as they turn dark brown or burn quite fast. I burnt some as I went out to gush about how many I could fit in the big oven at one go to hubby :) Let cool on the baking sheet, then transfer to a wire rack to cool completely. Eat as is or with hummus or a red pepper dip. Thanks for these super recipes Sarah, these will be a regular in my kitchen now! Check out the creations of my fellow Daring Bakers! The flatbreads are Yeast Spotted! Nothing can really make me skip a meal, specially breakfast, my post-walk ravenous tummy doubly ensures that! 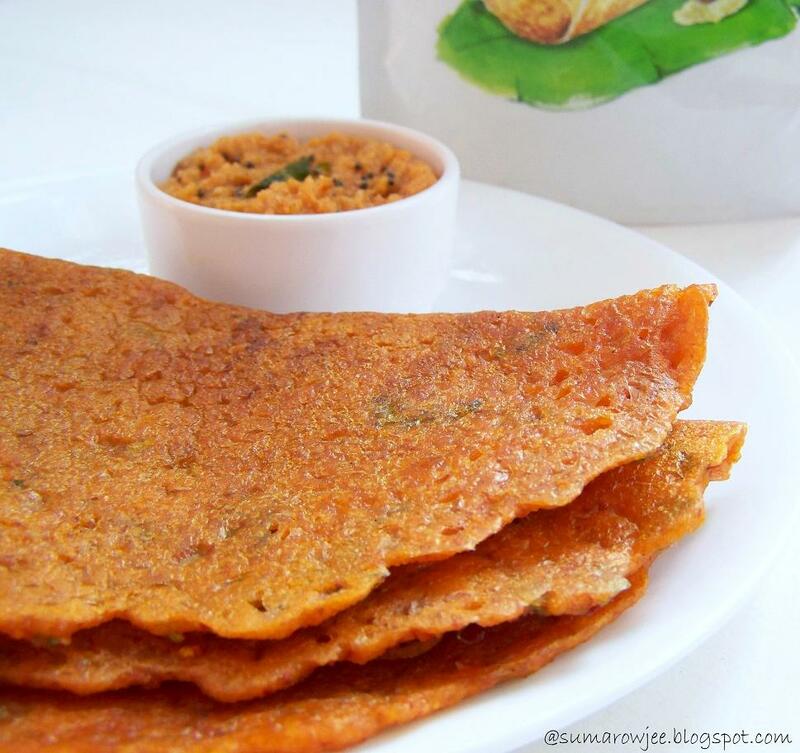 The South Indian breakfast staple dosa appears at least twice a week on the table. I, umm..OK..let me blurt it out again, I mostly buy my dosa batter...now please don't look at me like that!! I have a very strange problem with my batter fermenting properly and I am too lazy to make my own batter in my mixer. I have not had great experiences with instant dosa mixes earlier, so when Soulfull sent me their dosa mixes and raagi flakes for a product review, I was looking forward to see how these would turn out. They currently have launched Instant rawa dosa mix, adai mix and raagi dosa which they claim is low fat and sodium as well. 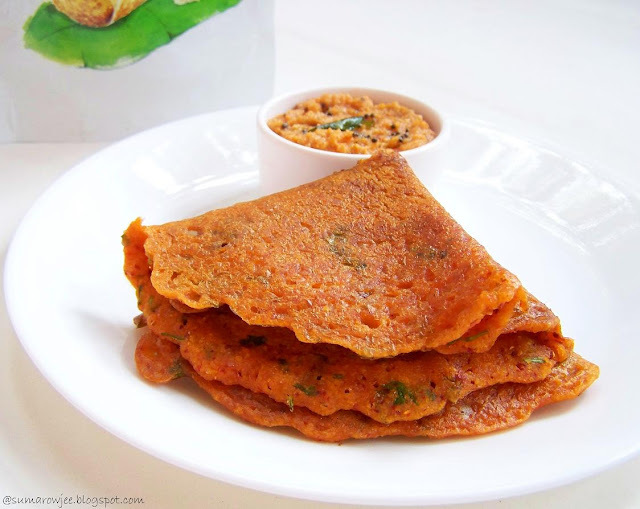 Adai is traditionally made with a mix of lentils, rice, spices and red chillies which gives the dosa its characteristic reddish color. The lentils are soaked, ground with the spices. If you enjoy your dosas spicy, this protein rich dosa makes a great change from the regular ones. The mix took a little more water than the proportions mentioned on the pack, but it was quite tasty with a very predominant flavor of hing. The batter was easier to spread and made thinner crispier dosas hours after it was mixed. The kids enjoyed their evening snack with spoonfuls of onion-coconut chutney. 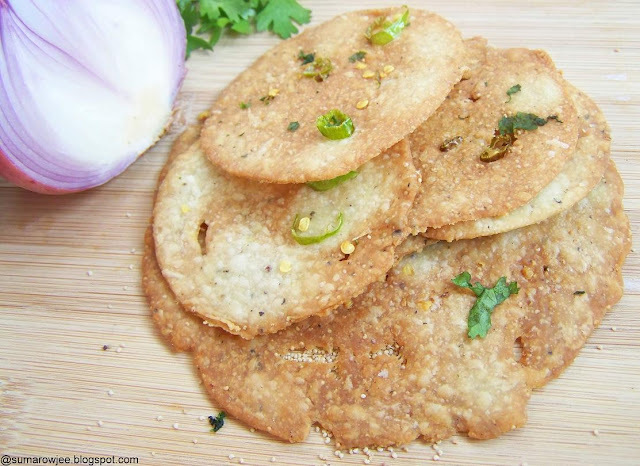 Hubby doesn't relish adai, but for the kids and me, Soulfull's gluten free ready mix of adai surely makes it to my grocery list! Though considered to be good for infants and diabetics due to its rich fiber and nutrition content Raagi /finger millet / nachini, is a relatively less used grain. My daughter who at first frowned at the dark colored dosa, took a reluctant bite and then happily ate it with her chutney. A winner here! The peppery rawa dosa mix though was not a hit with us, so I may not buy it again. The raagi flakes come in six flavors, chocolate, cocoa-lite, banana, strawberry and Tiramisu (interesting!). They little perfectly shaped flakes are crisp and claim to be 97% raagi. The flakes are just about sweet, which is a refreshing change from sweet cereals, perfect for the health conscious and diabetic people. The original flakes are not sweet, so will go well for savory snack ideas as well. Cocoa lite and banana have very mild cocoa and banana flavors. I like eating these flakes as a snack with fresh fruit and chilled milk..but my kids (being kids) did not take a liking to it...a more chocolaty version for them perhaps? Summing up, even for the dosa made from scratch lovers, the dosa mixes are surely good and handy for those busy mornings or lazy brunch on a weekend. 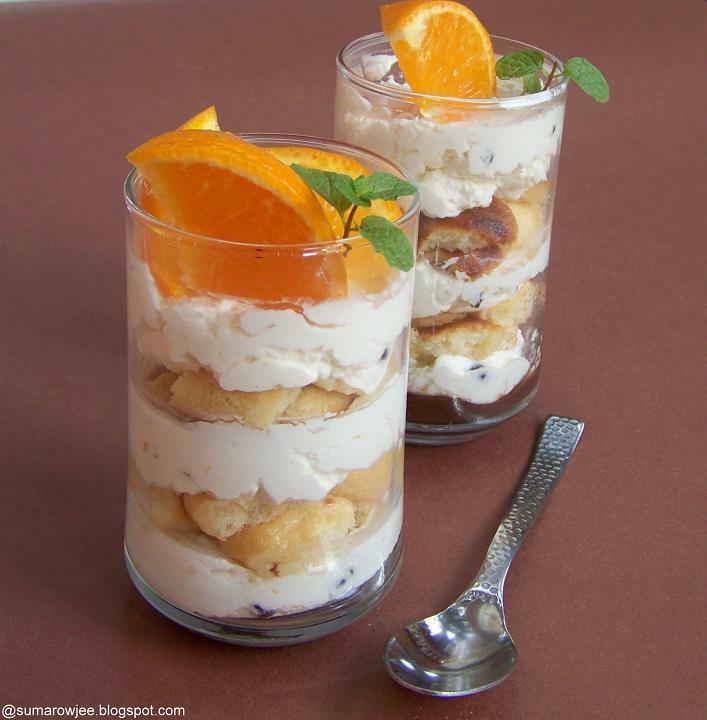 The flakes may appeal in some flavors to the adult palate rather than that of kids. Whole wheat flakes in good flavors perhaps? Yes, I think that would be great! 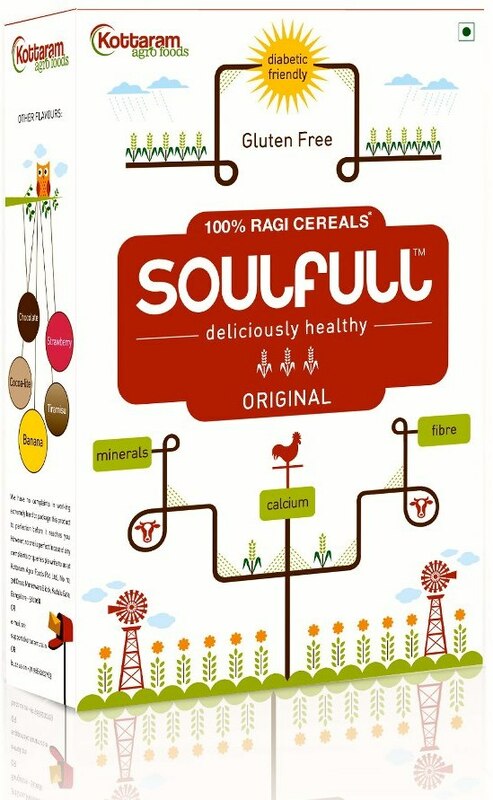 Soulfull products are currently available at Brown Tree, Spar outlets, Food Hall and Natures Basket outlets in Bangalore. The products will shortly be available at Total Mall, Food World & Nilgiris. Soulfull plans to also launch health mixes, muesli and energy bars. Thanks Soulfull and look forward to more healthy and promising products from you! 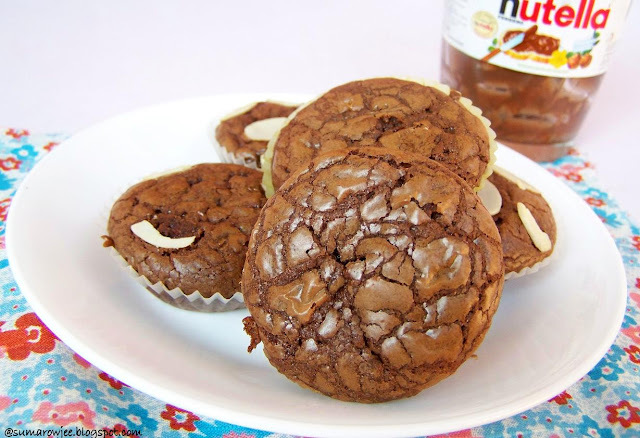 Super Easy & Quick Nutella Brownies - For World Nutella Day! 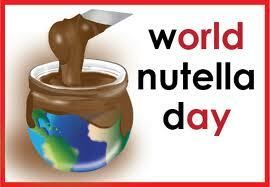 Just in time for World Nutella Day, whew! Determined to put up a post this year, I had made a mental note of the date. But as happens often with me, I thought that 5th is another day away! I realization about the confusion coming after I spent half my 'me -time' yesterday sent me into panic! Thankfully, I had baked Abby Dodge's famous little brownie bites last week, but was not sure about the pictures I had taken. More of a norm than not, I had to again rush bake, take pictures and put them away before the daughter alighted from her bus. Helped that these can actually be put together by the time your microwave pre-heats ( i.e, in about 2-3 minutes!) and get baked in about 12 minutes! Maybe Abby Dodge had harassed mothers and mothers with one eye fixed on the clock like me in mind when she created this recipe! Also patient, indulgent godmothers and grandmothers who love Sunday noon bake-play sessions. 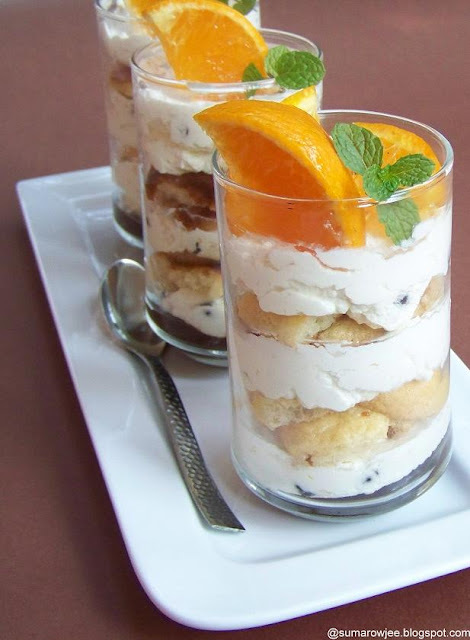 Yes, if you have not come across this recipe earlier, that's what this recipe is - child's play! The kind of recipe you may choose for your child to bake with her friends. Or may be bake them yourself for your Valentine if you are just about to start learning your way with butter, sugar and flour. A whisk, a bowl, a spoon and a mini scoop is all you need to bake these brownies. As easy as simply mixing together Nutella, egg, flour and vanilla...that is it! Feel free to add some coffee, toasted chopped nuts or some chopped dark chocolate. And you would have baked the easiest, quickest brownies. A tad chewy, quite tasty and fudgy baked from scratch in about 20 (OK, lets make that 25, we are talking about kids and beginners) minutes in all! These rich little things are better baked as little bites in a mini muffin pan or the tiniest cake liners you may have. 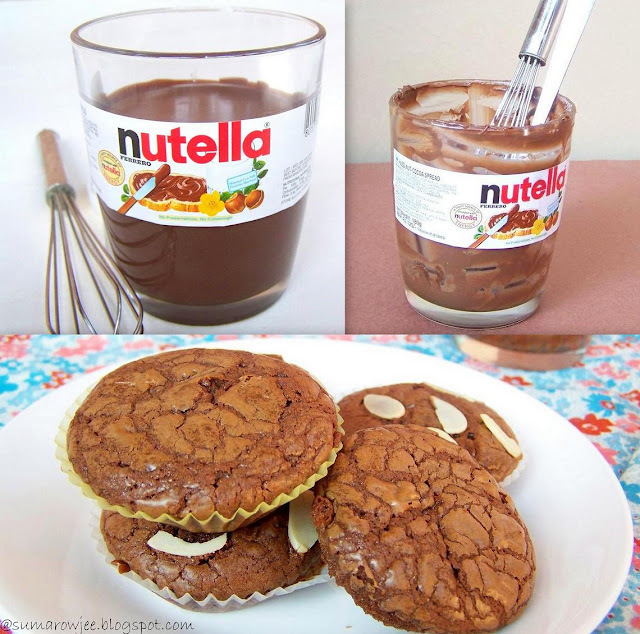 I prefer adding chopped hazelnuts or almonds to the batter as the chocolate chips may divert the taste from the nutty, chocolaty-enough taste of Nutella to more towards tasting very chocolaty... take your pick! Or you could use just the first 4 ingredients and bake. 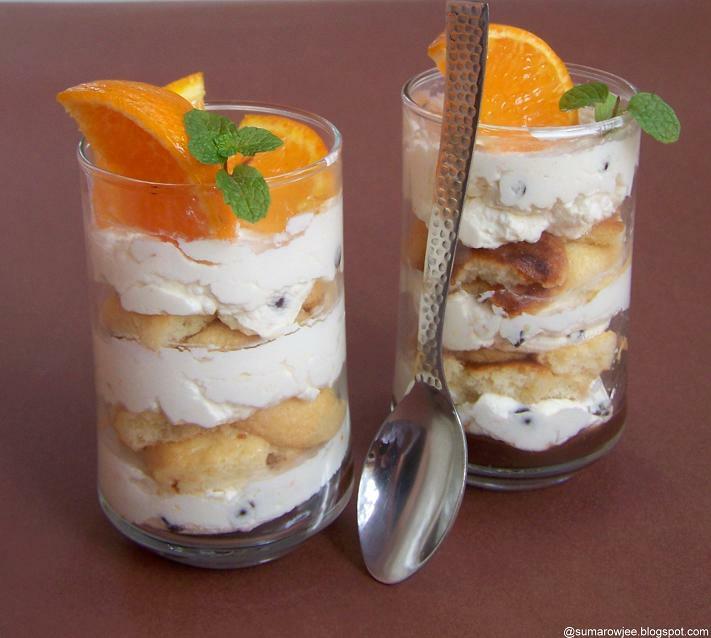 After all the simplicity and ease of the recipe is the best part about it! 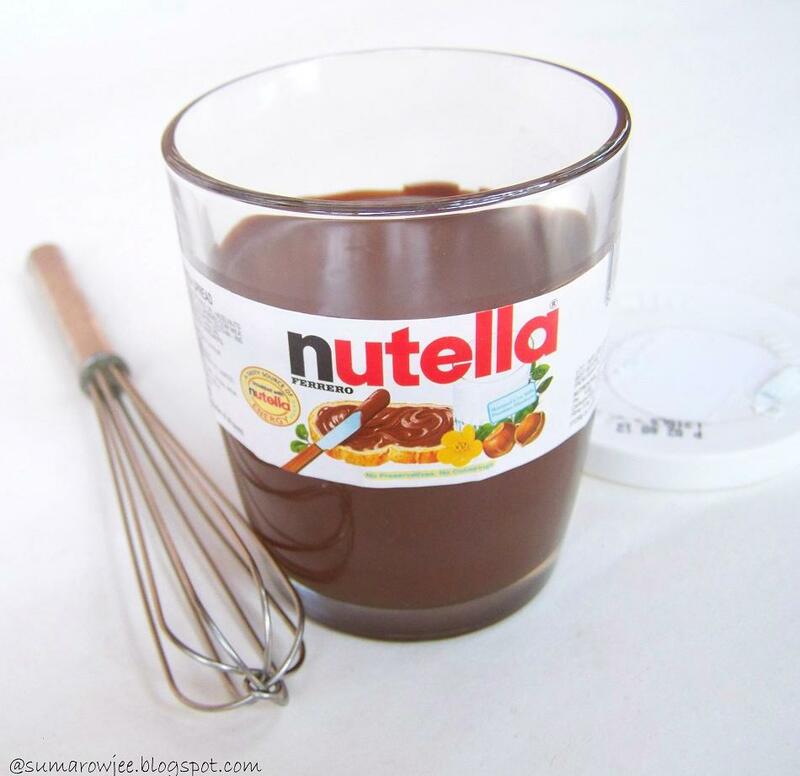 Use the smallest whisk (not a fork) you have especially if making half the recipe. The seemingly so little bit of batter is quite thick and viscous, using a regular sized whisk may get most of it clinging to the whisk. A one tablespoon cookie scoop is best suited to scoop out the batter into the liners says Abby. If you don't have one, use 2 small spoons. 1. Heat the oven to 180 degrees C/ 350°F. Line a 12-cup mini muffin pan with paper or foil liners. 2. Put the Nutella, egg, coffee and vanilla in a medium bowl and whisk until smooth and well blended. Add the flour and whisk until blended. 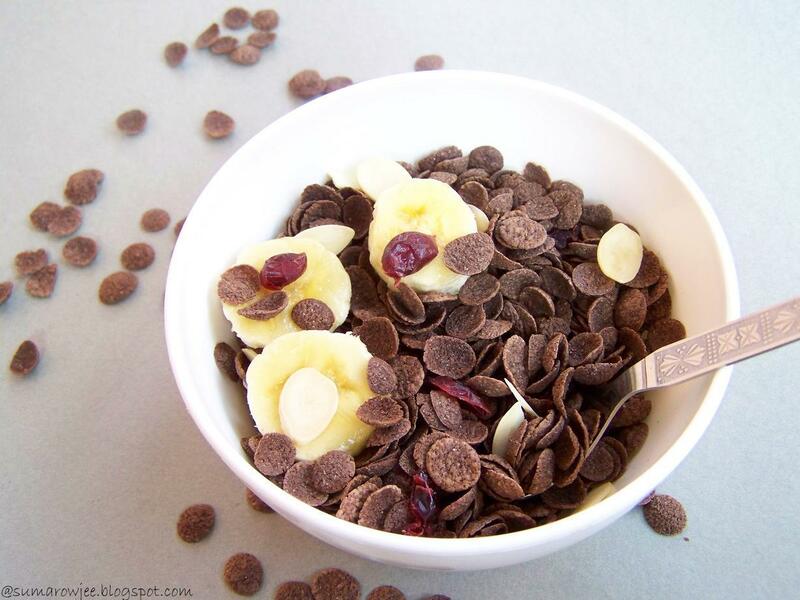 Fold in the nuts or chocolate chips if using. 3. Spoon the batter into the prepared muffin tin (about 3/4 full). 4. Bake for about 10-12 minutes or more depending on the size of the muffin pan or liners. A tooth pick inserted will come out with wet, gooey crumbs and the surface begins to crack . Do not over-bake or they will be dry-ish (but still tasty). Set on a rack to cool completely. Serve at room temperature. I have used slightly bigger cupcake liners and baked them for a little longer, about 15 minutes. The texture of these brownies is not exactly the same as regular brownies, but they will surely satisfy your chocolate cravings. The taste apart, this recipe had to be on my blog as one of the most ridiculously simple recipes I have come across and tried with success. This recipe will thrill the newbie baker and kids alike - so bring on the beginners, the kids and the lazy foodies - this one is for you! Chef At Large is India's largest online food network, founded by Sid Khullar. 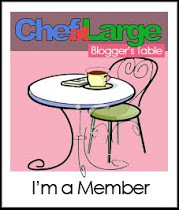 It also has a Bloggers Table which is an exclusive group of blogs and bloggers across Indian cities. Thanks Sid Khullar, am honored to be part of the Bangalore Table! The Bangalore table is quite recent, with Natasha Ali being the sole person who has been covering for Bangalore, her labor of love she says! As part of the bloggers table activities, regular meet ups at F&B establishments are held.. The first table meet was at Novotel's Blue Terrian and I was looking forward to meeting Natasha, Neha Mathur, Chinmayi Bhat, Nandita Iyer and Swapna Ventakesh.Monika Manchanda, Lubna Karim, Swati Raman Garg and Deepasri Deb could unfortunately not make it. Novotel Bengalru Techpark on Marthahalli - Sarjapur Outer Ring Road, recently launched its Poolside Bar and Barbeque Restaurant, Blue Terrain. On the evening of 27th January, I found myself surrounding by the tranquility and serenity only water can bring. Going by the theme, the restaurant has cascading water features, an al-fresco pool and soothing greenery. Perfect for eating smoking hot appetizers off the grill, daring the winter evening chill to get the better of you! Natasha and Abanti Banik, the Manager Marketing Services, Novotel, thoughtfully decided to have an early start to the evening. The very attentive and courteous staff handed us their signature cocktail and soft tail menu within a few minutes. I asked for Blue Sky, which was orange and pineapple juices, with coconut milk and cream and Blue Curacao. Very very nice, part from being very pretty to look at and yes photogenic too! 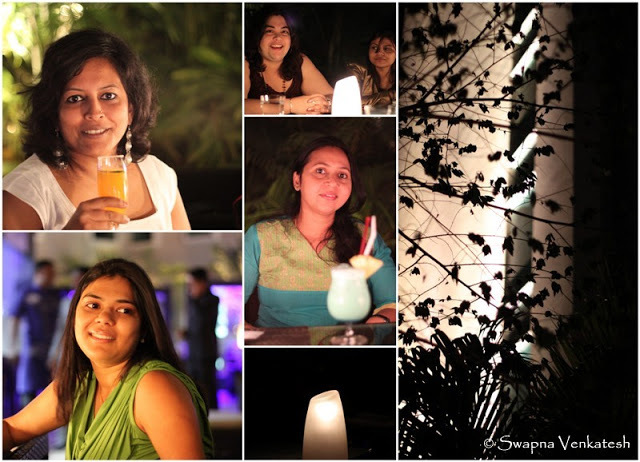 The ladies with the cameras clicked away, while Natasha (and me, no camera) kept joking that she would allow them just a minute more before the drinks and food went where they rightfully belonged! The executive chef Kailash Gundupalli suggested that he would send out everything on the menu for us to taste, which was a great idea. We started off with a salad, Leaf Lettuce, Grilled Tomato with Honey Mustard Dressing and Orange segments - nice, but nothing you would remember. Loved the really thin crust Grilled Eggplant and Onion pizza, fresh and tasty! Until very recently, I never could have imagined my pizza topped with this humble vegetable, I want to try and re-create a Mediterranean pizza at home as well...Pumpkin and carrots don't normally find a place in a barbeque menu, so it was really innovative to present these as maple Roasted Pumpkin and Honey Glazed carrots. Grilled just right retaining the crunch and texture of the vegetables, kudos! Tandoori cauliflower and broccoli along with the pumpkins and carrots must be mentioned as commendable effort by the chef to be more innovative and creative offering more options to the vegetarians, though there is more work needed on making these more flavorful. But then the very predictable potatoes and mushrooms were conspicuous by their absence, what a refreshing change! The masala Arbi (a surpsrise vegetable again) was good and crisp. The paneer in the Chatpata Panner Tikka and Vegetable and Paneer Brochettes with Pimento Marinate was soft enough considering the heat they would have been subjected to while being grilled. Moong Dal Seekh Kabab was another winner which I took second servings of! The staff had plans to organize for some bartending with fire, but could not as it was a little windy for this. But then Natasha sent some adrelanin rushing in as she tried the flaming shot. 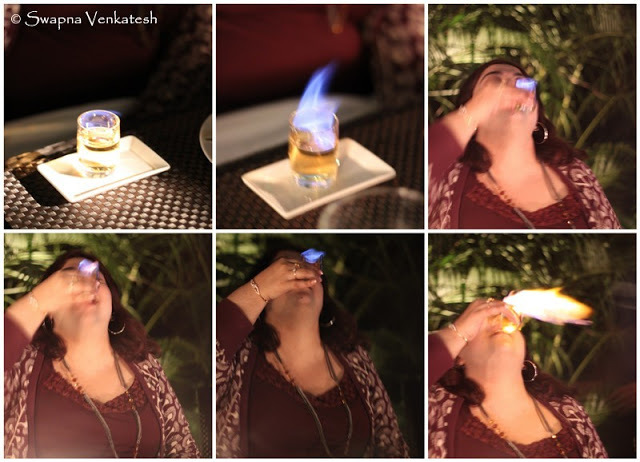 Blue Fire Shoot (Grand Marnier with Sambuca On Fire) A flaming drink to be gulped at one shot, brave brave girl, you had us all really really scared to just watch you! We were stuffed with all the grilled food and had absolutely no room for the main course. Desserts ? Always room for that! Again, we were served all the 4 desserts on the menu. Barbeque baked apple with caramel parfait - Really nice! I must tell you about this as I really don't like eating cooked fruit in apple pies and the kind. Mushy, sweet-sour fruit is something I don't enjoy. But this one with the apples sweet (US, Red) , cooked but firm sitting pretty on top of a lovely cake stole my heart! I hope the others did not notice me gathering the last bits, lapping it all up with the ice cream! I have changed my mind about not baking an apple cake, I am going to be baking one soon! Thanks Chef for making me a convert! Baked Cheese “ A La Maison” Yoghurt Sorbet and Berry Compote - was not a total disappointment, but then I am not a fan of graham cracker crusts nor cheese cakes. The yogurt sorbet definitely needs work! Grilled Seasonal Fruits with Toasted Almonds and Rum Ice Cream was appreciated by the others though I did not taste it. 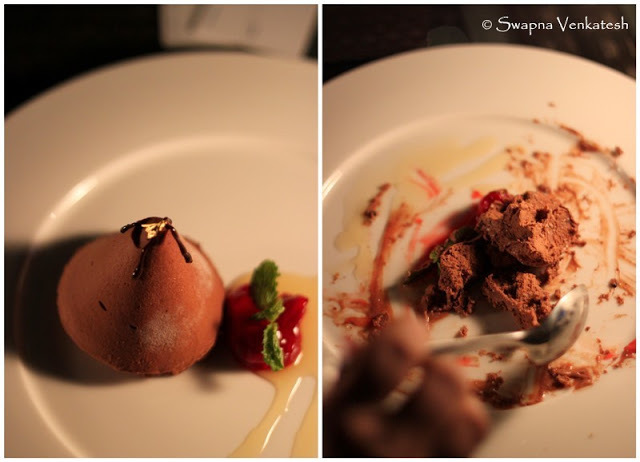 Kilimanjaro which was crisp praline croustillant hiding a mousse-ey chocolate interior served with citrus sauce. Dark, just about sweet - was gone in minutes, chocolate is always a winner! I am really really greedy when it come sto desserts, so I would say, more options on the menu please! Here is what I would say about the - Extremely pleasing ambiance, great for a quiet evening under the sky with decent grilled food...If you are a vegetarian you won't for once grumble that there aren't enough options. 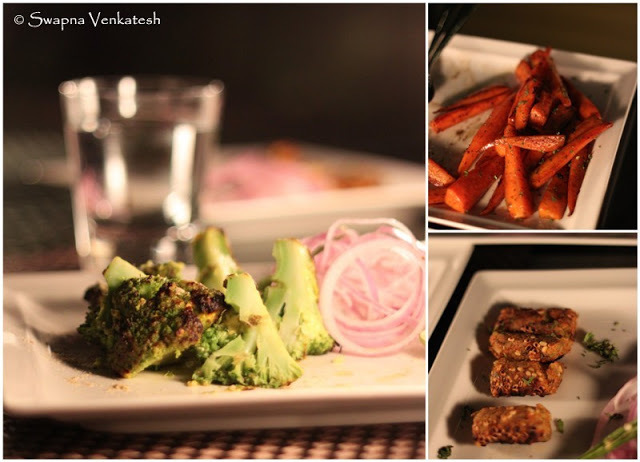 Kudos to the Chef for making this place a joy to visit for both the vegetarians and teh non-vegetarians as well! On the whole, a pleasant experience when you have a couple of hours to soak in the ambiance and savor some good hot food off the grill! Service is good, the staff and attentive, the food is good if not exceptionally so. Needs work - the sorbets and plating. Thanks so much Novotel for having us over, thanks to Abanti for being a wonderful hostess, we thoroughly enjoyed the evening!